Picking up where the previous issue left off, Kenan finds himself with Ching Lung in 1937 America. A crowd of Chinese people crowd around Super-Man, asking questions about who he is. Because Kenan sees the world through the eyes of the 1930s, the citizens appear ugly and goblin-like to him. Slam Bradley arrives and starts beating up on the Chinese. Ching Lung tells Kenan to focus his qi on trigram 3 - the trigram linked to his x-ray vision and one other power. Kenan accesses this power and the racist depictions transform into normal people. Slam continues to assault innocent people until Kenan decks him. Slam charges toward Kenan, whose first instinct is to use heat vision. Without making a conscious decision, Kenan finds his qi moving from his heat vision to his freeze breath. Ching Lung expresses disappointment that Kenan didn't burn Slam to ashes. The two enter a restaurant where Lung shows Kenan a German man by the name of Von Holtzendorff. Holtzendorff makes some racist remarks and demands Lung bring him and his daughter their food. Lung then shoots fire from his eyes and murders Holtzendorff. Lung tells Kenan to retrieve an object from Holtzendorff's person called the Red Jade Dragon. This item once belonged to the Qin Dynasty, but was stolen in 1900 by Holtzendorff after he massacred the rightful owners. Lung brought Kenan to 1937 to retrieve the item because Kenan's power and the power of the Red Jade Dragon share the same root - the Bagua. Lung reveals himself to truly be All-Yang - the embodiment of the principle of yang. All-Yang explains to Kenan that he trapped I-Ching in another realm (see previous issues). All-Yang promises to release I-Ching, but only if Kenan finds the Red Jade Dragon in the present, masters the entire Bagua, and becomes Emperor. Kenan wakes up in a life support tank and frees himself. He is greeted by Mingming and the rest of the JLC. 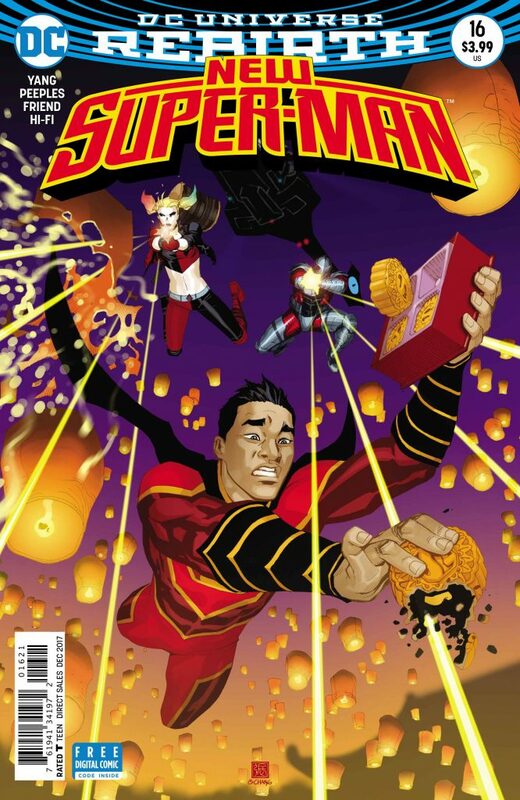 They inform Kenan that the Imperial Army was defeated, the villains were placed in the Crab Shell Prison, and the Suicide Squad returned to the U.S. Kenan fills the JLC in about his experiences and his new mission to free I-Ching. Upon telling Dr. Omen, Kenan is knocked out by a blast from a ray gun and put in a prison cell for his own protection. The JLC break Kenan out and they head fro Metropolis where they run into the American Justice League. Story - 4: There's a lot to love about this issue. For starters, I'm glad that DC is using this book as a platform to address their racist past. It's no secret that there were a lot of racist depictions of the Chinese in DC's books - particularly around the time of World War II. American characters were drawn to normally while Asian characters were drawn to look sub-human and monstrous. It was propaganda that perpetuated a fear of the Chinese, and later Japanese. Obviously, these cruel depictions are wrong, but this is how people thought in those days. It clearly doesn't justify their actions - racism is racism no matter the context - but it's important to remember that those actions were made as a result of ignorance and fear mongering. They were products of the times. The fact that DC is acknowledging their wrongdoings is a fantastic. Acknowledging the past and apologizing is what I expect from a company as well-known and respected as DC. There's a lot more I could say, but suffice it to say that I'm pleased the past is being addressed and being officially called out. Now that the heavy stuff is out of the way, let's get to the actual issue. As stated above, there's a lot of great stuff in this book. Yang teases little bits of future issues just perfectly and writes small little actions that will potentially affect characters later on. The best example is Kenan's qi moving to his ice breath instead of his heat vision. In the issue, Kenan discovers that sometimes he will need to follow where his qi goes. 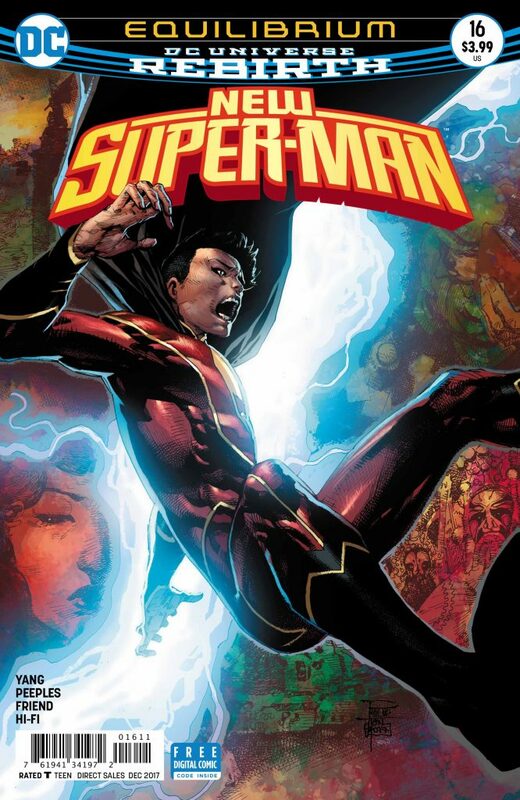 He won't always be in control of what power he feels he should use, but in a way that would make him more Superman-like. That's a pretty interesting spin on an already interesting spin. The last few pages of the book are just fine, but I feel the issue really should have ended with the JLC breaking Kenan out of his cell. I know that comic books require a certain number of pages to be constructed, but the last two pages of the JLC flying to America felt a bit unnecessary to me. Apart from it being a technical requirement to have a specific page number, I know it was done to tease the Justice League's first confrontation with the JLC. It's to sell readers on the next issue, but to be perfectly honest, I was already sold before the JLC even left China. Speaking of the Justice League, using them as the teaser for the next issue seems a little odd. There's no real reason for them to fight like the issue is trying to lead me to believe. Kenan is already cool with Superman - they've worked together on two separate occasions. If the Justice League is unsure of the JLC, Supes can vouch for Kenan. Hopefully it's a team-up instead of a fight. Knowing Yang, I know I can expect the former. Art - 4: The art in this issue is well done. Brent Peeples is able to almost perfectly replicate the art style of 1930s DC comics, for better and for worse. It's cool to see Slam Bradley, even though he's a racist jerk at this point in history. There's even a neat little joke that Kenan points out that Slam looks like Superman. If you know the history of Jerry Siegel and Joe Shuster before the publication of Superman, that's genuinely amusing. The stuff drawn like a modern book is also well done. Much like last issue, there's an homage to The Death of Superman with Kenan recovering from "death" and wearing a black suit with a silver "S" shield. There's very little I can actually complain about. There are a few odd lines here and there, but nothing that takes me out of the issue. Superman's face looks a bit...odd, though. Cover Art - 2: I feel like there was a better way to do this cover. Kenan looks really off and I have no clue what's going on with the proportions on his right hand. It's also near impossible to make out what any of the background images are supposed to be. The only one I can make out is the partial face on the bottom left of the cover. Variant Cover Art - 3: I don't care much for this cover either, but I like it just a bit better than the standard cover because I can make out what's going on.